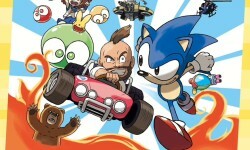 Update (September 9th) – The latest issue of Famitsu revealed more info on the collection including the full cover art for the collection, and that 3D Power Drift, 3D Puyo Puyo Tsuu (yessss), and 3D Maze Walker will be included with the collection. The latter two of which were found in the leaked list of games by the GBAtemp user. The post Sega 3D Fukkoku Archives 2 to Include 3D Sonic the Hedgehog (Updated) appeared first on Sonic Retro.